Trout Pool Cottage is a stylishly appointed, sunny, one bedroom cottage set in its own private garden close to the Kaituna River. It has an open fire, is fully carpeted and completely self-contained. There is a spa pool on the sunny verandah,Sky tv/dvd, stereo, and lots of books and magazines for the quiet times. 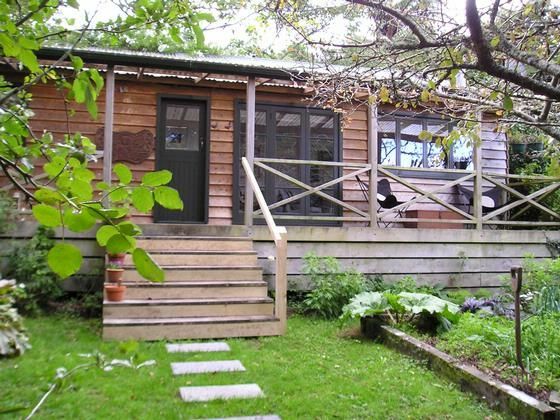 The cottage is located in Trout Pool Road, across the road from the Kaituna River where it leaves Lake Rotoiti at Okere Falls near Rotorua. Lake Rotoiti and the Kaituna River are world famous for trout fishing. The Kaituna River is particularly famous for its rafting and kyaking activities. The beautiful walk along Trout Pool Road, through the bush to the caves and the famous Trout Pool fishing spot is right at your door. There are boat ramps in the area and room to park a boat. The Okere Falls Store is a two minute walk away for exciting provisions, great coffee and river views. The wider area has lots of walks and bike tracks and has about fifteen different lakes to explore. A cozy spacious little cottage. Great little place. Plenty of space and amenities. Everything was provided and well equipped, extra blankets would be good and featherless bedding (have allergies to feathers!!) great location for Local cafe and great bush walks; nearby main road can be noisy at night. Had a lovely stay and Susan was very helpful. There is nothing to do but soak in the spa and relax, perfect! This place is just as terrific as the pictures! Maybe even better! Lovely quiet people who were very easy to deal with and who left the cottage in excellent condition. Would recommend them to anyone. We really enjoyed our weekend stay the cottage is very cosy, private and clean. The outdoor spa is a treat. Nice and close to the river and lake for kayaking too.